As my final thought on Guiding and Scouting Week, I think of the stories my dad tells of his days as a Boy Scout. My father was a Scout in the 1920s and 30s and he has fond memories of camping in the then very rustic Tamaracouta Boy Scout Camp near Montreal. Tamaracouta is still running, and it is the oldest continuing Scout Camp in the world. We have a photo of my dad and his teen buddies posing on a bridge in their Stetson hats and hiking poles on their way to Tamaracouta. Each teen has laughing eyes, gleaming with the fun of Scouting adventures. It is extremely poignant that within fifteen years the majority of the group had died fighting in World War Two. My dad is a whiz at knots and he taught me quite few of them. I was the fastest clove hitch tier in Guiding due to his training! Dad talks of hiking into Tamaracouta, swimming the lake and falling out of boats with great fondness for the adventures, but also for the great friends who shared them. Dad is also rather proud that he saw Lord and Lady Baden-Powell when they came to Canada on tour. He thought the young lady was a daughter, and was surprised when I pointed out B-P was some 30 years older than his wife Olave Soames! Dad did his best to follow B-P’s lead on that score as well, though Dad’s beautiful young wife (my mother) was only 15 years his junior. What are some of your Scouting memories? 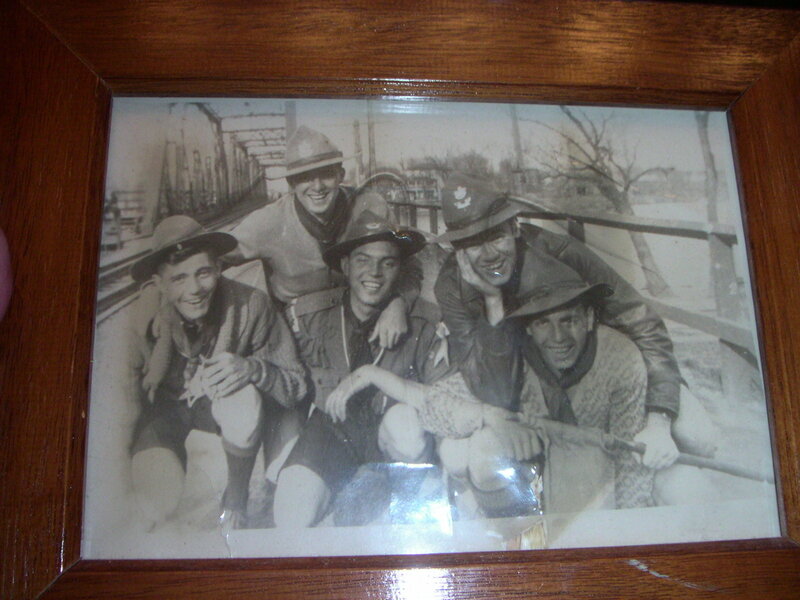 The Boy Scouts are (L>R) Vincent Martin, Herb Duguay, Kenneth Dow, Hart Savage and Jack Dow.